Suzuki Samurai Car Thermostat Replacement at your home or office. Suzuki Samurai Car Thermostat Replacement costs $119 on average. What is an engine cooling system thermostat and how does it work? The car's engine cooling system thermostat is a small valve within a cooling system passageway that opens and closes in response to the temperature of the circulating engine coolant. When your car is first started and the coolant is cold, the valve in the thermostat will be in the closed position, circulating the coolant flow only within the engine instead of flowing to the radiator, which allows the engine to warm up fast, promoting fuel efficiency, low emissions, and reduced engine deposits. Once the engine coolant reaches the design temperature, usually around 195 degrees, the valve will open and close as you drive in order to maintain a coolant temperature typically between 195 to 225 degrees Fahrenheit. Engine overheats. 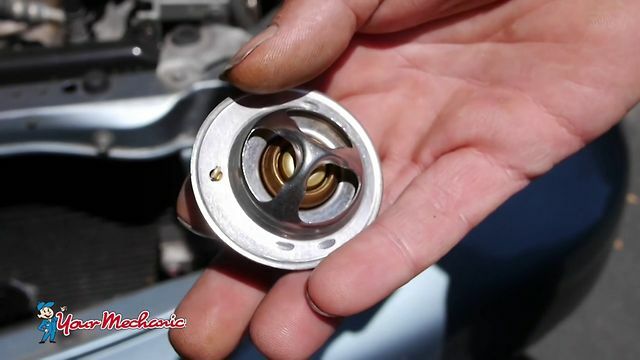 A thermostat with the valve stuck closed is a common cause of engine overheating. However, since there are other causes of overheating, a mechanic will thoroughly inspect the cooling system prior to condemning the thermostat. Since it is usually not known how badly the engine overheated, the mechanic will also try to determine if there is evidence that the cylinder head gasket was blown. If so, it would be repaired prior to replacing the thermostat. Temperature gauge reads too low or too high. Thermostats can get sticky, causing the engine temperature to stray from the optimal range. Your dash-mounted temperature gauge will notify you of this malfunction. Cooling system repairs. All thermostats eventually fail. Therefore, if the cooling system is already open for major repairs, such as water pump or radiator replacement, it is recommended to install a new thermostat simply as insurance against future breakdown. How do mechanics replace the engine cooling system thermostat? Once the engine is completely cold, the radiator cap is loosened and enough coolant is drained from the radiator so the coolant level is below the thermostat housing. The thermostat housing is removed and the thermostat and gasket are extracted. Note that some cars have more than one cooling system thermostat and both might need replacement. All mounting surfaces on the thermostat housing are cleaned of old gasket material. A new gasket is applied and the thermostat is re-installed in the correct orientation and with the temperature sensing cylinder facing downward towards the engine. The thermostat housing bolts are tightened to original equipment manufacturer (OEM) specifications using a calibrated inch-pound torque wrench. The cooling system is refilled with the appropriate coolant type and the system is fully bled of all air. The car engine is run until the normal operating temperature is reached, and while taking precautions with the hot coolant, the coolant level is rechecked while confirming there is flow through the radiator — either visually or with an infrared temperature gun. This will confirm the thermostat is open. Finally, the engine is checked for leaks. Is it safe to drive with an engine cooling system thermostat problem? No. If it has been determined that there is a thermostat problem, it should be repaired right away. Failure to do so can cause substantial and costly damage to the engine. Engine overheating due to causes other than a faulty thermostat, will themselves damage a thermostat. Therefore, always replace the thermostat if the engine overheats, even if the thermostat was not the initial cause of the overheating. The thermostat should be replaced anytime you have major work done on the coolant system. It is convenient and costs little during such repairs and insurance against future breakdown. OEM thermostats are the best ones to use and you can request your mechanic to install only the OEM thermostat. Dealer supplied, OEM thermostats are sometimes more costly but are generally higher quality and specifically engineered for your car.